A new colour publication A Field Guide to the Freshwater Fishes of the Kimberley has been launched, detailing the Kimberley's fascinating freshwater fishes, many unique to the region, and including newly described species. The discovery of these new species has almost doubled the number of known fish species in the Kimberley region in just three years. The authors say this means the entire biodiversity of life in Kimberley rivers is likely underestimated, which is particularly concerning as the pristine region is under threat from proposed developments. 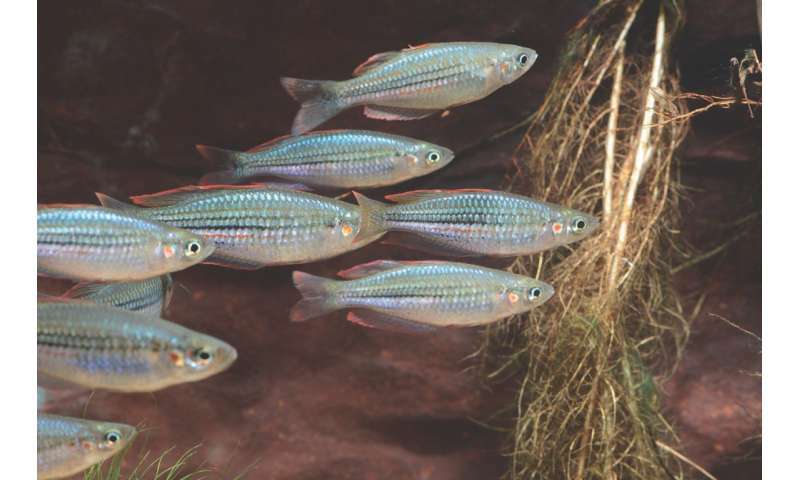 The researchers named one of the fish, Winton's grunter or 'Hannia wintoni' after the renowned author and conservationist Tim Winton, who has also written the foreword to the book. It isn't the only Kimberley fish with a famous name though, with Syncomistes butleri being named after celebrity naturalist Harry Butler who conducted some of the earliest fish research in Kimberley rivers. The field guide includes information about the deep cultural connection between Aboriginal people and the Kimberley's fishes including language, art and traditional ecological knowledge. The guide was developed as part of a national collaboration between the Museum and Art Gallery of the Northern Territory, University of Melbourne, Murdoch University's Freshwater Fish Group and Fish Health Unit, Museums Victoria and Western Australia Museum. "It's a matrix of valleys, mountains and gorges at a scale that's hard to comprehend. We're only beginning to understand the diversity of life that it supports, with almost every expedition to the region finding species new to science," Dr Shelley said. "Our best estimates suggest that around a third of Australia's freshwater fish species live in the Kimberley's rivers, and most are unique to the region. These fish communities are at risk, with federal government plans to 'develop the north' and tame one of the earth's last great wildernesses. We need to understand what lives there, so we can protect it. This book captures current scientific knowledge of the Kimberley's freshwater fishes, as well as a wealth of indigenous ecological knowledge." Co- author Dr Matthew le Fuevere, also from the School of Biosciences at the University of Melbournesaid that while the region has long been identified as a hotspot of freshwater fish diversity including many species unique to the Kimberley, we are only beginning to understand the region's true aquatic diversity. "There is still much to learn about the Kimberley's fishes and, with a growing number of threats across the region, we need to act quickly to fill knowledge gaps and conserve potentially vulnerable species," Dr le Feuvre said. "This timely field guide combines the latest scientific knowledge and millennia of indigenous insight into one accessible volume. This book will improve awareness of the Kimberley's freshwater fishes, guide future research and inform conservation management." "It's a rare pleasure to be able to witness how the various species have reacted to what are relatively minor environmental differences present in each of the separate river systems," Dr Gomon said. "The new field guide is underpinned by the latest research and museum collections to better map and describe local species. The information is easily accessible with spectacular colour photography of fishes and their habitats, and provides an important platform for improved awareness and conservation." It details freshwater fish species numbers, distinguishing features, locations, habitat, biology and conservation are contained within the Field Guide, along with information about the cultural connections between Aboriginal language, art and traditional ecological knowledge.